‹ Harley Goes Electric! Will it Fly? Wow, Jeannine, you really nailed so much in that short post — about the gender of riders, the assumptions people hold, and the value of the experience as passenger when you’ve always had the controls. I took the back seat just last week for the first time in about three years (and only once before that). And who took the controls? 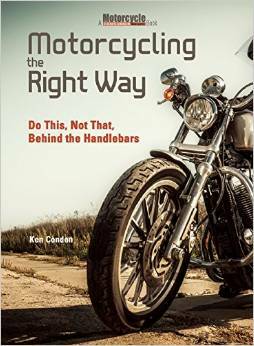 Your Dad, the amazing mentor/teacher/coach/all around motorcycle guru. Let me explain. My husband, Tom, and I started riding in 2011. We bought our WeeStroms and then took the MSF training down here in Connecticut. Pretty cocky, eh? We were both in our late 50s then and I knew I would be bored silly riding on the back so I insisted on my own bike from the start. I had never ridden a motorcycle before. We’ve done over 22,000 miles so far (Nova Scotia, across country, West Virginia, and lots of local riding) but a few particular situations on the road continued to really cause me great anxiety — particularly hairpin turns that are ascending to the right. Argh! I would always end up in the on coming lane, stopped, or worse. So this spring when I saw Ken’s note about day long training, Tom and I decided to sign up. That’s one of the best decisions I’ve ever made. What! He wasted no time as the terror struck. I scooted back, he got on, we rode the smallest, tightest turns I had ever experienced. I was sure we were going to die! But he just kept going around in these beautifully controlled smooth turns with me on the back. I probably didn’t breathe even once. Well, he stopped, got off, and gave me back the controls. I was in shock. I had no idea my motorcycle could turn like that. What an experience! I can’t say that I immediately could maneuver like a master, but the sensation of moving confidently through a small turn, feeling the energy of the motorcycle, the physics of motion, was a real eye opener. Wow. We’ve gone back to our own parking lot a couple of times since and I am so improved — more to the left than the right but both are so much better. The day after our lesson, we rode up the north entrance to Mount Greylock and down the south, with the nice little hairpins, and I handled them better than I ever have. Tom made us turn around and do the south road a couple more times. And each time, I felt more control. During the day long training with Ken, we rode up to Vermont and, through our helmet communicators, he worked with both of us on our technique in many different riding situations. We’ll never ride curves the way we used to. Even though we had the general outside inside outside concept, Ken had a way of giving us an even deeper understanding how to read the road and place ourselves in the best possible position for safety and visibility. Wow. We’re off to Oregon for a three week gallavant this summer on our bikes. Seeing all the hairpin turns on the maps I feel much more prepared to meet them with safety and confidence thanks to your Dad. Thank you, Ken. Spending a day (or half a day even) with Ken for a rider at any level will be so valuable. If it’s crossed your mind, do it. You’ll be so glad you did. Thanks, Ken. And keep posting, Jeannine! Ride on! I will never forget my first riding experiences as a teenager with my buddy who was a few years older than me. I was a fearless passenger, leaning with him into the turns, begging him to go faster, pass cars, and do all the crazy stuff that teens do. We were unstoppable. Then, I got my license and my own motorcycle. I dropped off my bike at the shop one day, and I rode passenger with him to get home. We rode about 30 miles, and when I got off, I swore I would never ride passenger again. I can still see his crestfallen face when I told him that. I actually have ridden passenger with him again since then, but I will always remember that feeling of utter lack of control on the back. What used to feel safe now felt like a roller coaster ride. It’s all relative, I guess! 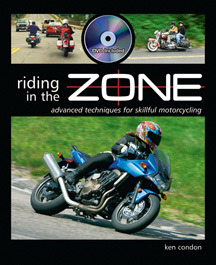 If you like being a passenger, consider taking an experienced rider course with your pilot. I did this with my wife Amy and we both learned a tremendous amount. The most important thing was how to control emergency situations together, allowing me to have maximum control during heavy braking, for example, without worrying about how she will react.